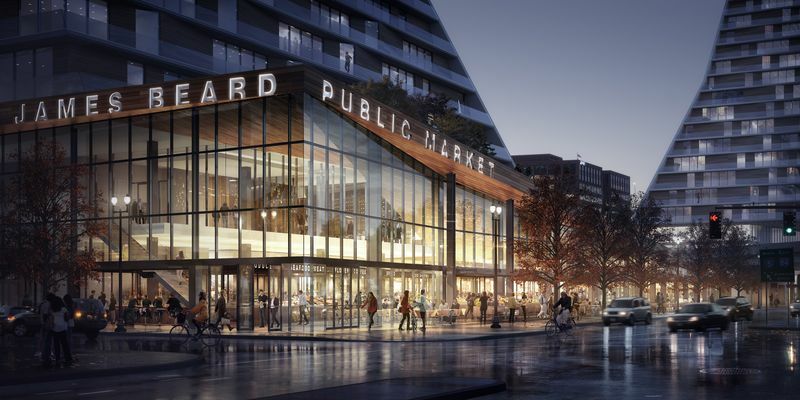 Portland Architecture broke the news that the James Beard Public Market will no longer be built at the Morrison Bridgehead site. The market’s board of directors is now investigating other sites. The Oregonian reported that the Morrison Bridgehead site, formerly owned by Multnomah County, is now owned by MMDC Company. With work underway on the Field Office , on NW Front Ave, The Oregonian reported that developer Project^ “imagines new neighborhood north of the Pearl“. Site work has begun on the Multnomah County Central Courthouse, according to The Oregonian. As part of its “Regional Snapshots” series Metro took a look at Portland-area housing costs, and the factors that influence them. 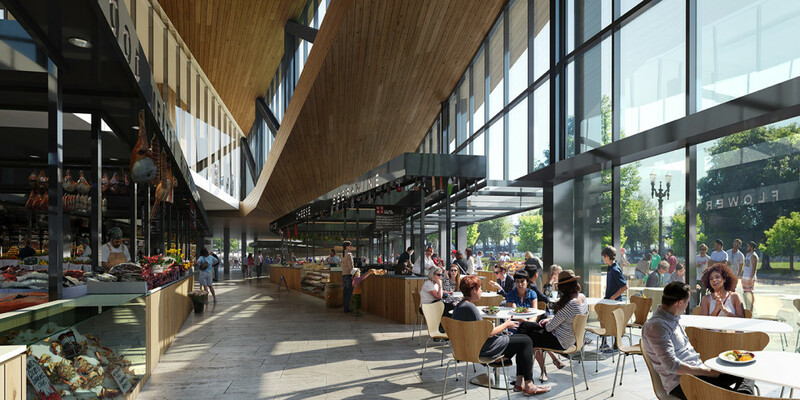 Designs for the James Beard Public Market were released by Snøhetta. Portland Architecture provided extensive coverage of the announcement, where Snøhetta founding partner Craig Dykers spoke about how they arrived at the design. OHSU has raised the $500 million match needed to gift from Phil Knight. The money will help the university move ahead with the Center for Health & Healing South and the Knight Cancer Research Building. Also at OHSU, Portland Monthly had a look at the soon to open Treehouse Apartments by Lever Architecture. The apartments are a rare residential development on Marquam Hill. The Portland City Council approved a ‘make or break’ deal with ZRZ Realty that will spur development on the Zidell Yards. Upcoming micro restaurant spot The Zipper has lined up another tenant: Paydirt, a new bar by the people behind The Old Gold. Creative agency Swift has signed a lease for 30,000 sq ft of office space at the under construction 1638 NW Overton building. The City is considering whether developers should be able to receive extra density for affordable housing. A Community Open House for the planned James Beard Public Market will take place this Saturday, December 13th at OMSI, from 2pm – 5pm. As was first reported in Portland Monthly, the design of the building is being led by Norwegian architects Snøhetta. 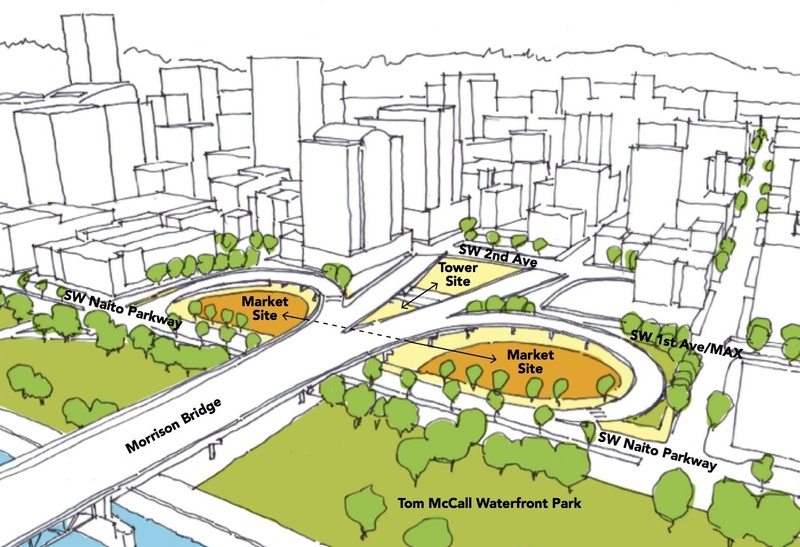 The market is proposed for land at the Morrison Bridge Head, currently owned by Multnomah County. The county agreed in 2012 to sell the land to a group including the Public Market Foundation and Melvin Mark Development. The Foundation intends to build a daily, year-round, indoor-outdoor marketplace, which would include 50 permanent vendors, 40 day tables, full-service restaurants, a teaching kitchen and an event space. The open house will be an opportunity to meet the design team, share ideas, and influence the design. There will be a presentation at 2:30 PM by the architects, the Market’s non-profit foundation, and Mayor Hales. The event is free to the public, and children are welcome.